Oscar Hallam was born on a farm near Linden WI in 1865, the youngest of seven children. In 1892 he married Edith Lott. He received his bachelors degree from University of Wisconsin in 1887, and his law degree from that institution in 1889. Shortly thereafter he moved to St. Paul and took up the practice of law. He was appointed to the Second Judicial District in 1905. From there he was appointed to the Minnesota Supreme Court in 1912. He served on this bench for ten years until he resigned in order to run for the United States Senate in 1924. Following his defeat in the primaries, he returned to the practice of law in St. Paul. 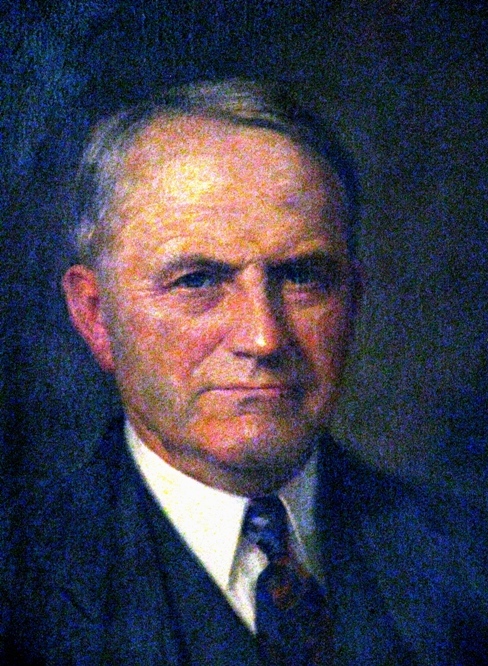 Hallam was Dean of the St. Paul College of Law (now William Mitchell College of Law) from 1901 to 1941, and from thereafter as President of the college until his death. His 23 year stint as dean was longer than anyone else’s in the school’s history. Under Hallam, the college also gained its ABA accreditation in 1938. A respected figure in criminal law, in 1926 he served as Chairman of the Minnesota Crime Commission. During this time he helped originate the State Department of Criminal Apprehension and the Board of Parole. He also served as Chairman of the Section on Criminal Law of the American Bar Association. He authored much-cited Some Object Lessons on Publicity in Criminal Trials, 24 MN Law Rev. 453 (March 1940). This article details the trial of Bruno Richard Hauptman, who was ultimately convicted of the abduction and murder of the Lindbergh baby. Hallam wrote a series of sketches about his youth which were published in the Minnesota Historical Society periodical. (27 MINNESOTA HISTORY 2 (June 1946)) In his “Bloomfield and Number Five” sketch, he describes his parents’ immigration to the United States, and his own growing up years. Oscar Hallam died on September 23, 1945. Oscar Hallam even has a Wikipedia page devoted to him. Douglas R. Heidenreich, With Satisfaction and Honor: William Mitchell College of Law 1900-2000, (William Mitchell College of Law 1999).